The United States is not a State Party to the Rome Statute of the International Criminal Court (Rome Statute), which founded the International Criminal Court (ICC) in 2002 as a permanent international criminal court to "bring to justice the perpetrators of the worst crimes known to humankind – war crimes, crimes against humanity, and genocide", when national courts are unable or unwilling to do so. As of January 2019[update], 123 states are members of the Court. Other states that have not become parties to the Rome Statute include India, Indonesia, and China. On May 6th, 2002, the United States, in a position shared with Israel and Sudan, having previously signed the Rome Statute formally withdrew its signature and indicated that it did not intend to ratify the agreement. 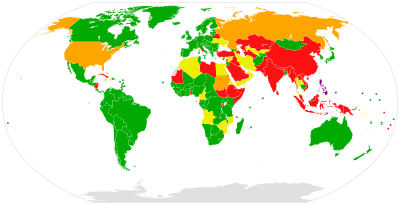 United States policy concerning the ICC has varied widely. The Clinton Administration signed the Rome Statute in 2000, but did not submit it for Senate ratification. The George W. Bush Administration, the U.S. administration at the time of the ICC's founding, stated that it would not join the ICC. The Obama Administration subsequently re-established a working relationship with the Court as an observer. Following years of negotiations aimed at establishing a permanent international tribunal to prosecute individuals accused of genocide and other serious international crimes, such as crimes against humanity, war crimes, and the recently defined crimes of aggression, the United Nations General Assembly convened a five-week diplomatic conference in Rome in June 1998 "to finalize and adopt a convention on the establishment of an international criminal court". On 17 July 1998, the Rome Statute was adopted by a vote of 120 to 7, with 21 countries abstaining. The seven countries that voted against the treaty were Iraq, Israel, Libya, China, Qatar, Yemen, and the United States. U.S. President Bill Clinton originally signed the Rome Statute in 2000. Signature of a treaty provides a preliminary endorsement, but a treaty that is signed but not ratified is not legally binding. Signing does not create a binding legal obligation, but does demonstrate the State's intention to examine the treaty domestically and consider ratifying it, and it obliges the State to refrain from acts that would counter or undermine the treaty's objective and purpose. Nonetheless, signature is the right action to take at this point. I believe that a properly constituted and structured International Criminal Court would make a profound contribution in deterring egregious human rights abuses worldwide, and that signature increases the chances for productive discussions with other governments to advance these goals in the months and years ahead. After the Rome Statute reached the requisite 60 ratifications in 2002, President George W. Bush's Administration sent a note to the U.N. Secretary-General on May 6, 2002. The note informed the Secretary-General that the U.S. no longer intended to ratify the Rome Statute, and that it did not recognize any obligation toward the Rome Statute. In addition, the U.S. stated that its intention not to become a state party should be reflected in the U.N. depository's list. This is because signatories have an obligation not to undermine the object and purpose of a treaty according to Article 18 of the Vienna Convention on the Law of Treaties, also sometimes referred to as the good faith obligations. According to American Non-Governmental Organizations Coalition for the International Criminal Court, the U.S. could engage with the Court by reactivating its signature to the Rome Statute by submitting a letter to the Secretary-General. A treaty becomes part of the municipal law of a nation only when the treaty has been ratified, accepted, or acceded to. In the U.S., the Constitution gives the President power to negotiate treaties under the Treaty Clause of Article Two. The President must then submit a treaty to the Senate for advice and consent for ratification, and the Senate must approve the treaty by a two-thirds majority before it can take effect. The Senate may submit amendments, reservations, or explanations to the President regarding the treaty. Once ratified, treaties are generally self-executing—at least from the perspective of other nations—as the ratifying state fully binds itself to the treaty as a matter of the public international law and of national honor and good faith. In the U.S., however, a treaty does not immediately become effective as U.S. domestic law upon entry into force, which occurs only if the treaty is self-executing. In Foster v. Neilson 27 U.S. 253 (1829), the U.S. Supreme Court explained that treaties are self-executing if accompanying legislation is not necessary for implementation. A treaty requiring additional action is not self-executing; it would create an international obligation for the U.S., but would have no effect on domestic law. (Id. 314-315). The position of the Bush Administration during its first term in office was to unalterably oppose U.S. ratification of the Rome Statute, believing Americans would be unfairly treated for political reasons. Moreover, the Bush Administration actively pursued a policy of hostility towards the Court in its international relations, exceeding merely staying out of the statute, instead following the provisions of the American Service-Members' Protection Act, in seeking to guarantee that U.S. citizens be immune to the court and to thwart other states from acceding to the statute without taking U.S. concerns into account. The U.S. vigorously pressed states to conclude "Article 98 agreements," bilateral immunity agreements (BIAs) with the U.S. that would guarantee its citizens immunity from the court's jurisdiction, threatening to cut off aid to states that refused to agree. However, Bush Administration officials tempered their opposition to the ICC in the Administration's second term, especially after the departure of John Bolton from the Bush Administration. The United States did not oppose using the ICC to prosecute atrocities in Darfur, Sudan, as evidenced by the U.S. abstention on United Nations Security Council Resolution 1593 referring the Darfur situation to the ICC for prosecution. In a statement, the State Department's Legal Adviser John Bellinger stated: "At least as a matter of policy, not only do we not oppose the ICC's investigation and prosecutions in Sudan but we support its investigation and prosecution of those atrocities." In addition, the U.S. House of Representatives, in a resolution, acknowledged the ICC's authority to prosecute war crimes in Darfur. The Obama Administration stated its intent to cooperate with the ICC. Cooperation with the Assembly of States Parties of the ICC was a key component of the Obama Administration's first National Security Strategy. 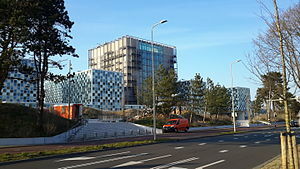 On November 16, 2009, the Ambassador-at-Large for War Crimes Issues, Stephen Rapp, announced that he would lead the U.S. delegation to the ICC's annual meeting of the Assembly of States Parties in The Hague. He told journalists "Our government has now made the decision that Americans will return to engagement at the ICC." The U.S. participated as an observer. This was the first time the U.S. had a delegation attend the ICC's annual meeting of the Assembly. In response to a question from the Senate Foreign Relations Committee, Secretary of State Hillary Clinton remarked that the U.S. will end its "hostility" towards the court. In addition, Susan Rice, U.S. Ambassador to the United Nations, in her first address to the Security Council expressed U.S. support for the court's investigation in Sudan. These statements coupled with the removal of sanctions to the BIAs signaled a positive shift in the U.S. cooperation with the Court. The Obama Administration made no formal policy decision yet on the ICC or the status of the BIAs, and did not state an intention to rejoin the Rome Statute or submit the treaty to Senate ratification. The Administration sent a large delegation to the Review Conference of the Rome Statute in Kampala, Uganda in May and June 2010. The final outcome from Kampala included a successful assessment of the Rome Statute system of international justice, the announcement of numerous formal pledges by countries to assist the court, and the adoption of amendments on war crimes and the crime of aggression. The U.S. co-sponsored a side event with Norway and the Democratic Republic of the Congo (DRC) on building the capacity of the DRC's judicial system to address atrocity crimes. The U.S. announced two pledges at Kampala, and was the only non-State Party to make a pledge. The U.S. formally committed to building the legal capacity of certain countries to prosecute atrocity crimes themselves, and to assisting the ICC in its investigation and prosecution of the leaders of the Lord's Resistance Army, a rebel group originating from Uganda and led by Joseph Kony. The Conference adopted two sets of amendments. The administration[who?] believes that the outcome on both is in accord with important U.S. interests. The Conference adopted a definition for the crime of aggression, the conditions under which it would exercise jurisdiction, and a roadmap for the eventual activation of jurisdiction after January 1, 2017. The U.S. initially raised concerns about the definition, but accepted it after other countries agreed to attach a set of detailed understandings to the resolution adopting the amendments. Under the amendment, the ICC will be, first, unable to prosecute individuals of a non-state party, and second, state-parties will have the opportunity to opt out of aggression jurisdiction if they so wish. After 12 years, I think we have reset the default on the U.S. relationship with the Court from hostility to positive engagement. In this case, principled engagement worked to protect our interest, to improve the outcome, and to bring us renewed international goodwill. The United States and many advocates for the ICC have long been at odds over the Court's statute, accountability, and jurisdiction. Although these differences have not been resolved, two recent actions have refocused international and domestic attention on America's policy toward the ICC. The first was enactment of the "Nethercutt Amendment", which extended prohibitions on assistance to ICC parties beyond those already in place under the American Service-Members' Protection Act (ASPA). The second is the debate over whether or not the U.N. Security Council should refer the genocide in Sudan to the ICC for investigation. In 2002, the U.S. Congress passed the American Service-Members' Protection Act (ASPA), which contained a number of provisions, including authorization of the President to "use all means necessary and appropriate to bring about the release of any U.S. or allied personnel being detained by, on behalf of, or at the request of the International Criminal Court", and also prohibitions on the United States providing military aid to countries which had ratified the treaty establishing the court. However, there were a number of exceptions to this, including NATO members, major non-NATO allies, and countries which entered into a BIA with the United States not to hand over U.S. nationals to the Court, as well as any military aid that the U.S. President certified to be in the U.S. national interest. In addition, ASPA contained provisions prohibiting U.S. co-operation with the Court, and permitting the President to authorize military force to free any U.S. military personnel held by the court, leading opponents to dub it "The Hague Invasion Act". The act was later modified to permit U.S. cooperation with the ICC when dealing with U.S. enemies. It has been argued that the act was a measure created to protect Americans from ICC jurisdiction or prosecution. On October 2, 2006, President Bush issued waivers of the International Military Education and Training (IMET) prohibitions with respect to 21 nations. Foreign Military Financing (FMF) restricted under ASPA were not affected by the 2006 waivers or the ASPA amendment. On October 17, 2006, Bush signed into law an amendment to ASPA as part of the John Warner National Defense Authorization Act for Fiscal Year 2007 removing IMET restrictions for all nations. On November 22, 2006, Bush issued ASPA waivers with respect to the Comoros and Saint Kitts and Nevis, followed by a similar waiver with respect to Montenegro on August 31, 2007. On January 28, 2008, Bush signed into law an amendment to the ASPA to eliminate restrictions on FMF to nations unwilling to enter into BIAs shielding U.S. nationals from the jurisdiction of the ICC. Section 1212 of HR 4986 effectively gutted from ASPA all of the provisions which threaten nations with the loss of military assistance of any kind for refusing a BIA. The effects of the ASPA were severely criticized by the Defense Department. While speaking before the U.S. House Committee on Armed Services regarding the FY 2006 Budget, U.S. Army General Bantz J. Craddock, Commander of the U.S. Southern Command, made strong statements on the impact of ASPA on military operations and cooperation in Latin America. He explained that the ASPA was creating a void of contact that is being filled by other extra-hemispheric actors, including China. Vice Admiral Lowell Jacoby made similar statements during a hearing of the Senate Armed Services Committee. In addition, the Chairman of the Joint Chiefs of Staff, Air Force General Richard Myers, testified at the Senate Appropriations Defense Subcommittee on April 27, 2005, that the ASPA has reduced foreign troop training opportunities and hurt the government's ability to fight terrorism abroad as an "unintended consequence". Former Representative George Nethercutt's "Nethercutt Amendment" to the Foreign Operations, Export Financing, and Related Programs Appropriations Act suspends Economic Support Fund assistance to ICC States Parties who refused BIAs with the U.S. or were not provided a Presidential waiver. The funds affected support initiatives including peacekeeping, anti-terrorism measures, democracy-building, and drug interdiction. The language of the amendment allowed presidential exemptions for NATO, MNNA (major non-NATO allies), and Millennium Fund countries. The Nethercutt Amendment differed from former anti-ICC provisions of the ASPA by imposing economic aid cuts instead of military aid cuts. Cutting economic assistance is a far more damaging act because, in many countries, it intended to bolster local economies instead of national defense. In addition, existing status of forces agreements (SOFAs) and other bilateral agreements already provide full U.S. jurisdiction over U.S. personnel and officials serving abroad. The appropriations bill containing the controversial amendments were adopted for FY 2005, FY 2006, and FY 2008. Congress did not pass a foreign operations appropriations bill or any other bill containing the Nethercutt provision for FY 2007. On December 17, 2007 the U.S. Congress approved HR 2764, a comprehensive Consolidated Appropriations Act which reinstates the so-called Nethercutt provision cutting off Economic Support Funds (ESF) to nations unwilling to enter into BIAs or so-called Article 98 Agreements shielding U.S. nationals from the jurisdiction of the ICC. President Bush signed the bill into law on December 26, 2007, and it became Public Law 110-161. However, by mid-2009, Congress had removed all the IMET restrictions and failed to renew the Nethercutt Amendment. Map of countries which have signed Article 98 agreements with the United States. Orange states are members of the ICC. Red states are non-members. The states parties to the Rome Statute. Article 98 of the Rome Statute prohibits the ICC from requesting assistance or the surrender of a person to the ICC if to do so would require the state to "act inconsistently" with its obligations under international law or international agreements unless the state or the third-party state waives the immunity or grants cooperation. The U.S. has interpreted this article to mean that its citizens cannot be transferred to the ICC by any state that has signed a bilateral agreement with the U.S. prohibiting such a transfer, even if the state is a member of the Rome Statute. The U.S. actively pressured states to conclude such so-called Article 98 agreements, otherwise known as bilateral immunity agreements (BIAs). The Bush Administration claimed that the BIAs were drafted out of concern that existing agreements—particularly the status of forces agreements or status of mission agreements (SOFAs or SOMAs)—did not sufficiently protect Americans from the jurisdiction of the ICC. Until 2008, the ASPA and the Nethercutt Amendment required the cessation of ESF to those states which had ratified the Rome Statute unless they signed a BIA (though they could be exempted from this if they were a member of NATO or a major non-NATO ally). ESF entails a wide range of governance programs including international counter-terrorism efforts, peace process programs, anti-drug trafficking initiatives, truth and reconciliation commissions, wheelchair distribution, and HIV/AIDS education, among others. In March 2006, Condoleezza Rice said that blocking military aid to those seeking to fight terrorism is "sort of the same as shooting ourselves in the foot". Mali, Namibia, South Africa, Tanzania, and Kenya publicly rejected signing BIAs in 2003, and subsequently saw their development aid funding cut by more than 89 million dollars. According to the Coalition for the International Criminal Court, as of 2006, 52 countries had "rejected U.S. efforts to sign bilateral immunity agreements (BIAs), despite unrelenting U.S. pressure and the threat and actual loss of military assistance". By Spring 2006, such agreements had been accepted by approximately one hundred governments and were under consideration by approximately eighteen more. By 2009, with Obama in office, the laws cutting aid unless BIAs were no longer in place; the Nethercutt Amendment had not been renewed, and the restrictions mandated in the ASPA had already been repealed under Bush. As of that year, 102 BIAs had been signed, though it was not clear how many were legally binding, and the U.S. had ceased pursuing more agreements. Romania was one of the first countries to sign an Article 98 agreement with the United States. In response to Romania's action, the European Union requested that candidate countries not sign Article 98 agreements with the United States until the EU ministers had met to agree upon a common position. In September 2002, the Council of the European Union adopted a common position, permitting member states to enter into Article 98 agreements with the United States, but only concerning U.S. military personnel, U.S. diplomatic or consular officials, and persons extradited, sent to their territories by the United States with their permission; not the general protection of U.S. nationals that the United States sought. Furthermore, the common position provided that any person protected from ICC prosecution by such agreements would have to be prosecuted by the United States. This was in agreement with the original position of the EU, that Article 98 agreements were allowed to cover these restricted classes of persons but could not cover all the citizens of a state. Others[who?] argue that, due to the patriation of the ICC into the territory of every state-party, the ICC has effectively become a domestic court of the sovereign state in question, and, as an internal affair of the state-party, exemption of Americans from the jurisdiction of the ICC would render U.S. citizens "above the law"—specifically the domestic law—of the state-party, giving them such rights as Europeans were once given under the "unequal treaties" with some developing countries. Others[who?] believe that a State Party has simply given itself another option for the exercise of its sovereign right to deal legally as it wishes with persons who commit crimes on its territory. In July 2002, the United States threatened to use its Security Council veto to block renewal of the mandates of several U.N. peacekeeping operations, unless the Security Council agreed to permanently exempt U.S. nationals from the Court's jurisdiction. The Secretary-General of the United Nations, Kofi Annan, said that the U.S. proposal "flies in the face of treaty law", risks undermining the Rome Statute, and could end up discrediting the Security Council. Initially, the United States sought to prevent prosecution of personnel on U.N. missions by any country except that of their nationality. The Security Council rejected that approach, and the United States made use of a provision of the Rome Statute that allowed the Security Council to direct the ICC not exercise its jurisdiction over a certain matter for up to one year. The United States sought the Security Council to convey such a request to the ICC concerning U.S. personnel on United Nations peacekeeping and enforcement operations. Further, the U.S. sought to have that request renewed automatically each year. (If renewed automatically each year, then another Security Council resolution would be required to cease the request, which the United States could then veto, which would effectively make the request permanent.) ICC supporters argued that the Rome Statute requires that, for the request to be valid, it must be voted upon each year in the Security Council. Therefore, an automatically renewing request would violate the Statute. By international law, questions regarding the interpretation of the U.N. Charter may only be interpreted by the U.N. Security Council. The U.N. Charter requires that all U.N. members abide by the decisions of the Security Council, so only ICC members who are not also U.N. members are not bound. Other members of the Security Council opposed this request; however, they were increasingly concerned about the future of peacekeeping operations. The United Kingdom eventually negotiated a compromise, whereby the United States would be granted its request, but only for a period of one year. A new Security Council vote would be required in July each year for the exclusion of peacekeepers from ICC jurisdiction to be continued. All members of the Security Council eventually endorsed United Nations Security Council Resolution 1422. NGO supporters of the ICC, along with several countries not on the Security Council (including Canada and New Zealand), protested the legality of the resolution. The resolution was made under Chapter VII of the U.N. Charter, which requires a "threat to international peace or security" for the Security Council to act; ICC supporters have argued that a U.S. threat to veto peacekeeping operations does not constitute a threat to international peace or security. In such a case, the U.N. Charter states that the Security Council will determine if the Security Council's actions conformed with the U.N. Charter. A resolution to exempt citizens of the United States from jurisdiction of the ICC was renewed in 2003 by United Nations Security Council Resolution 1487. However, the Security Council refused to renew the exemption again in 2004 after pictures emerged of U.S. troops torturing and abusing Iraqi prisoners in Abu Ghraib, and the U.S. withdrew its demand. The ICC has been criticized for absence of jury trials; allegations of retrials allowed for errors of fact; allegations that hearsay evidence is allowed; and allegations of no right to a speedy trial, a public trial, or reasonable bail. Supporters of the ICC say that the ICC Statute contains the due process rights found in the U.S. Constitution and now well recognized in international standards of due process in Article 67 Rome Statute, with the exception of the right to jury trial. The list of due process rights guaranteed by the Rome Statute are, if anything, more detailed and comprehensive than those in the American Bill of Rights. ... I can think of no right guaranteed to military personnel by the U.S. Constitution that is not also guaranteed in the Treaty of Rome. The U.S. has adopted forms of war crimes and crimes against humanity within its military courts. The military courts have jurisdiction over all military personnel abroad and any accompanying civilians. Further, the U.S. has adopted crimes of genocide within its domestic system and conscription of child soldiers. United States participation in the ICC treaty regime would also be unconstitutional because it would allow the trial of American citizens for crimes committed on American soil, which are otherwise entirely within the judicial power of the United States. The Supreme Court has long held that only the courts of the United States, as established under the Constitution, can try such offenses. This statement refers to several issues. The first is the trial of American citizens by the ICC and implies that the Court does not have the power to try Americans for crimes committed on U.S. territory. The second refers to due-process issues. RenewAmerica claim that ratification by the United States of the Rome Statute would require a constitutional amendment, as was the case in other countries such as the Republic of Ireland. According to RenewAmerica, "Because the ICC is inconsistent with fundamental constitutional protections, the federal government is without authority to ratify the treaty absent a constitutional amendment." Critics argue that, because the U.S. Constitution permits the creation of only one Supreme Court, participation with the International Criminal Court violates the U.S. Constitution. However, the Court is not a creation of the U.S.; instead, it functions internationally. Further, the U.S. has participated in various international courts including the International Military Tribunal for the Far East, the Nuremberg trials, and the tribunals for the former Yugoslavia and Rwanda. The Congressional Research Service's Report for Congress states the ICC is not "an instrumentality of the U.S.". Therefore, it does not threaten to supplant the Constitutional authority of the U.S. Supreme Court. The true measure of America's commitment to peace and justice and its opposition to genocide and war crimes lies not in its participation in international bureaucracies like the ICC, but in its actions. The United States has led the fight to free millions in Afghanistan and Iraq. It is a party to many human rights treaties and, unlike many other nations, abides by those treaty commitments. The U.S. has led the charge to hold violators of human rights to account, including fighting hard for imposing Security Council sanctions on the Sudanese government until it stops supporting the militia groups that are committing genocide in Darfur and helps to restore order to the region. The U.S. polices its military and punishes them when they commit crimes. In every practical way, the U.S. honors the beliefs and purposes underlying the ICC. In a 2005 poll of 1,182 Americans by the Chicago Council on Global Affairs and the Program on International Policy Attitudes at the University of Maryland, 69% favored U.S. participation in the ICC. Should the United States ratify the 'Rome Statute of the International Criminal Court'? If not, what concerns do you have that need to be resolved before you would support joining the court? Prior to ratification, what should the United States relationship with the Court be, particularly in regards to sharing intelligence, prosecuting war criminals, and referring cases to the U.N. Security Council? Obama answered: "Yes[.] The United States should cooperate with ICC investigations in a way that reflects American sovereignty and promotes our national security interests." Senator John McCain, the Republican presidential candidate in the 2008 elections, said on January 28, 2005: "I want us in the ICC, but I'm not satisfied that there are enough safeguards." He also later stated: "We should publicly remind Khartoum that the International Criminal Court has jurisdiction to prosecute war crimes in Darfur and that Sudanese leaders will be held personally accountable for attacks on civilians." Fourth, Europe must acknowledge that the United States has global responsibilities that create unique circumstances. For example, we are more vulnerable to the misuse of an international criminal court because of the international role we play and the resentments that flow from that ubiquitous presence around the world. That does not mean, in my opinion, that the United States should walk out of the International Criminal Court. But it does mean we have legitimate concerns that the world should address, and it is fair to ask that there be sensitivity to those concerns that are really focused on the fact that the United States is active on every continent in the world. As we look to the future, there are so many opportunities for us to renew our relationship and we need to because we face so many challenges. Consistent with my overall policy of reintroducing the United States to the world, I will as President evaluate the record of Court, and reassess how we can best engage with this institution and hold the worst abusers of human rights to account. The United Nations and the ICC are inherently incompatible with national sovereignty. America must either remain a constitutional republic or submit to international law, because it cannot do both. The Constitution is the supreme law of the land, and the conflict between adhering to the rule of law and obeying globalist planners is now staring us in the face. At present we fortunately have a President who opposes the ICC, but ultimately it is up to Congress – and concerned citizens – to insure that no American ever stands trial before an international court. Bill Richardson, the Governor of New Mexico, said in 2007 while campaigning for the 2008 Democratic nomination: "We must repair our alliances ... renew our commitment to International Law and multilateral cooperation ... this means joining the International Criminal Court." As president of the United States, I intend to take America in a different direction, rejecting war as an instrument of policy, reconnecting with the nations of the world, so that we can address the real issues that affect security all over the globe and affect our security at home: getting rid of all nuclear weapons, the United States participating in the chemical weapons convention, the biological weapons convention, the small arms treaty, the landmine treaty, joining the International Criminal Court, signing the Kyoto climate change treaty. We should be the natural leader in ... these areas ... when America doesn't engage in these international institutions, when we show disrespect for international agreements, it makes it extraordinarily difficult when we need the world community to rally around us ... we didn't used to be the country of Guantanamo and Abu Ghraib. We were the great light for the rest of the world, and America needs to be that light again. Benjamin B. Ferencz, an investigator of Nazi war crimes after World War II and the Chief Prosecutor for the United States Army at the Einsatzgruppen trial, one of the twelve "subsequent Nuremberg trials" held by the U.S. authorities, later became a vocal advocate of the establishment of an international rule of law and of an International Criminal Court. In his first book, published in 1975 and entitled Defining International Aggression-The Search for World Peace, he argued for the establishment of an international court. ^ "The States Parties to the Rome Statute". International Criminal Court. Archived from the original on March 1, 2018. Retrieved February 25, 2018. ^ Human Rights Watch (July 2008). Courting History: The Landmark International Criminal Court's First Years. New York. ^ a b c "UN Treaties: Chapter XVIII – Penal Matters – item 10. Rome Statute of the International Criminal Court". Archived from the original on June 4, 2011. Retrieved October 19, 2010. ^ United Nations (1999). Rome Statute of the International Criminal Court — Overview Archived January 13, 2008, at the Wayback Machine. Retrieved on 31 January 2008. ^ Coalition for the International Criminal Court. Rome Conference — 1998 Archived October 19, 2012, at the Wayback Machine. Retrieved on 31 January 2008. ^ a b Michael P. Scharf (August 1998). Results of the Rome Conference for an International Criminal Court Archived May 15, 2012, at the Wayback Machine. The American Society of International Law. Retrieved on 31 January 2008. ^ "Definition of key terms used in the UN Treaty Collection" (PDF). Archived (PDF) from the original on March 6, 2008. Retrieved March 8, 2008. ^ "Clinton's statement on war crimes court". BBC News. December 31, 2000. Archived from the original on July 20, 2012. Retrieved February 5, 2008. ^ "Bush Approach to the ICC". The American Non-Governmental Organizations Coalition for the International Criminal Court. 2009. Archived from the original on November 3, 2013. Retrieved October 5, 2015. ^ "Referendum Commission explanatory leaflet proposed changes to the Constitution in relation to ratification of the Rome Statute of the International Criminal Court". Referendum Commission of the Republic of Ireland. Archived from the original on March 16, 2008. Retrieved March 7, 2008. ^ "Ratification of the Rome Statute of the International Criminal Court". Select Committee of Foreign Affairs, Parliament of Ireland. Archived from the original on March 16, 2008. Retrieved March 7, 2008. ^ "A Campaign for US Immunity from the ICC". Archived from the original on July 28, 2013. Retrieved October 10, 2013. ^ "Chronology of Bush Administration Statements and Actions Regarding the ICC" (PDF). Archived (PDF) from the original on October 30, 2008. Retrieved March 6, 2008. ^ "H.Res. 726, 110th Congress, October 2007" (PDF). Archived (PDF) from the original on May 16, 2008. Retrieved March 6, 2008. ^ "U.S. Engagement With the ICC and the Outcome of the Recently Concluded Review Conference". US Department of State. Archived from the original on October 13, 2016. Retrieved September 17, 2016. ^ a b "The Bush Administration's Policy on the International Criminal Court is Correct". The Heritage Foundation. March 8, 2005. Archived from the original on April 21, 2011. Retrieved April 23, 2011. ^ a b "U.S.: 'Hague Invasion Act' Becomes Law". Human Rights Watch. August 3, 2002. Archived from the original on January 4, 2012. Retrieved December 23, 2007. ^ a b c "The Non-Renewal of the 'Nethercutt Amendment' and its Impact on the Bilateral Immunity Agreement (BIA) Campaign" (PDF). AMICC. April 30, 2009. Archived (PDF) from the original on December 20, 2016. Retrieved September 17, 2016. ^ Schiff, Benjamin (2008). Building the International Criminal Court. Cambridge University Press. ^ Kenneth W. Martin. "Fiscal year 2004 security assistance legislation and funding allocations". DISAM Journal. Archived from the original on October 21, 2012. Retrieved March 7, 2008. ^ Mazzetti, Mark (July 23, 2006). "U.S. Cuts in Africa Aid Said to Hurt War on Terror". The New York Times. Archived from the original on April 17, 2009. Retrieved May 26, 2010. ^ "The politics of poverty: Aid in the new Cold War" (PDF). Christian Aid. Archived (PDF) from the original on June 1, 2013. Retrieved September 17, 2016. ^ "Countries Opposed to Signing a US Bilateral Immunity Agreement (BIA): US Aid Lost in FY04&FY05 and Threatened in FY06" (PDF). CICC. Archived (PDF) from the original on December 21, 2018. Retrieved September 17, 2016. ^ "The EU's Human rights & Democratisation Policy: September 30, 2002: International criminal court (ICC) – Council Conclusions" (PDF). General Affairs and External Relations Council of the European Commission, 12134/02 (Presse 279), p.9. Archived (PDF) from the original on October 29, 2013. Retrieved October 28, 2013. ^ "The Ambiguities of Security Council Resolution 1422 (2002)". The European Journal of International Law. Archived from the original on October 10, 2007. Retrieved March 3, 2008. ^ "Annan condemns US Bosnia veto". BBC News. July 3, 2002. Archived from the original on June 20, 2006. Retrieved March 3, 2008. ^ "Efforts to Obtain Immunity from ICC for U.S. Peacekeepers". The American Journal of International Law. 96: 725–729. July 2002. doi:10.2307/3062185. JSTOR 3062185. ^ "The United States and the International Criminal Court". Human Rights Watch. Archived from the original on November 24, 2010. Retrieved December 4, 2016. ^ a b c "SECURITY COUNCIL REQUESTS ONE-YEAR EXTENSION OF UN PEACEKEEPER IMMUNITY FROM INTERNATIONAL CRIMINAL COURT". Press Office of the United Nations Security Council. Archived from the original on December 27, 2013. Retrieved June 29, 2017. ^ Jim Wurst (July 15, 2002). "ICC: UN Security Council Resolves Immunity Debate". UN Wire. Archived from the original on April 1, 2008. Retrieved March 3, 2008. ^ "Q&A: International Criminal Court". BBC News. March 20, 2006. Archived from the original on March 7, 2008. Retrieved March 3, 2008. ^ "The International Criminal Court's antagonism toward our Constitution". Renew America. September 9, 2006. Archived from the original on October 8, 2006. Retrieved September 10, 2006. ^ Van der Vyver, Johan David. Implementation of International Law in the United States. p. 181. ISBN 978-3-631-59880-1. Archived from the original on June 21, 2013. Retrieved October 29, 2016. ^ "Myths and Facts About the International Criminal Court". Human Rights Watch. Archived from the original on November 23, 2010. Retrieved December 4, 2016. ^ "The International Criminal Court vs. the American People". Archived from the original on February 12, 2008. Retrieved December 24, 2007. ^ Nicholas S. Curabba, "The Rome Statute of the International Criminal Court: Selected Legal and Constitutional Issues," CRS Report for Congress, February 22, 1999. ^ "Americans on the Darfur crisis and ICC". Archived from the original on February 4, 2008. Retrieved February 5, 2008. ^ "Large Bipartisan Majority of Americans Favors Referring Darfur War Crime Cases to International Criminal Court" (PDF). Archived (PDF) from the original on October 30, 2008. Retrieved February 5, 2008. ^ "Candidate Questionnaire: 2004". Global Solutions. Archived from the original on March 17, 2008. Retrieved February 5, 2008. ^ Bob Egelko (January 2, 2008). "Presidential candidates diverge on U.S. joining war crimes court". San Francisco Chronicle. Archived from the original on March 6, 2012. Retrieved March 7, 2019. ^ "Citizens for Global Solutions Applauds Senator McCain's Support of the International Criminal Court" (PDF). Citizens for Global Solutions. January 28, 2005. Archived (PDF) from the original on December 2, 2007. Retrieved February 5, 2008. ^ John McCain and Bob Dole (September 10, 2006). "Rescue Darfur Now". The Washington Post. Archived from the original on May 12, 2008. Retrieved May 26, 2010. ^ "Excerpts from Remarks of Senator Hillary Rodham Clinton German Media Prize Dinner". Archived from the original on March 15, 2005. Retrieved August 29, 2006. ^ "08 or Bust!, Your Foreign Policy Road Map". Citizens for Global Solutions. November 12, 2007. Archived from the original on March 17, 2008. Retrieved February 5, 2008. ^ Senator Ron Paul. "A Court of No Authority". Archived from the original on February 2, 2008. Retrieved February 5, 2008. ^ "A New Realism in Foreign Policy". Bill Richardson for President. 2007. Archived from the original on August 1, 2007. Retrieved August 5, 2007. ^ "South Carolina Democratic debate transcript". MSNBC. Archived from the original on January 19, 2008. Retrieved February 5, 2008. ^ Edwards Seeks to Make 2nd Time a Charm, The Times and Democrat, December 28, 2006. ^ "John Edwards Announces Bid for 2008 Democratic Presidential Nomination". Washington Post. December 28, 2006. Archived from the original on November 11, 2012. Retrieved May 26, 2010. ^ "Benjamin B Ferencz, Biography". Archived from the original on January 9, 2008. Retrieved March 1, 2011. Paul D. Marquardt, "Law Without Borders: The Constitutionality of an International Criminal Court," 33 Colum. J. Transnat'l. L. 74, 76 (1995). Madeline Morris, ed. (2001). "The United States and the International Criminal Court", Law and Contemporary Problems, Winter 2001, vol. 64, no. 1. Accessed January 2, 2008. Michael P. Scharf (1999). "The Politics behind U.S. Opposition to the International Criminal Court", Brown J. World Aff., Winter/Spring 1999, vol. VI, p. 97. Rebecca Hamilton (2011). Fighting for Darfur: Public Action and the Struggle to Stop Genocide, Palgrave Macmillan, Chs. 5, 11.